The next regular meeting of The Vancouver Poultry and Fancy Pigeon Association will be on will be held Sunday, June 2, 2019 from 2:00 PM - 4:00 PM at the office of Ernie Silveri (Western Hatchery): 505 Hamm Street, Abbotsford, BC V2T 6B6. The CPFA National Classic will be held on Saturday Dec. 7th, 2019 hosted by the Sarnia Pigeon & Poultry Club in Sarnia, Ontario. More details will follow. Contact myself, Gary Parsons at garyhelmet@yahoo.ca for more information. We are excited to announce that our Judge will be Bernd Wanke of Germany. Bernd is one of the great Jacobin breeders and judges of our time. What an incredible show this will be. We already have breeders from both the US and Canada, from the Atlantic to the Pacific and some from overseas planning to attend. In addition to this great Jacobin show we are planning to have this show in conjunction with the CPFA Classic show which is Canada’s National all breed show. So start planning to attend now. January 8th & 9th, 2021. Brandon Manitoba, Canada. Welcome to the Vancouver Poultry & Fancy Pigeon Association website. 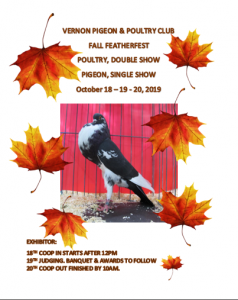 We are one of Canada’s oldest and most progressive pigeon clubs and for over a century members of our organization have shared the the enjoyment and challenges in the raising and exhibition of fancy pigeons. I invite you to go through our website and learn about our organization For more information about membership and how to join our organization click here. The Vancouver Poultry & Fancy Pigeon Assoc. The Vancouver Poultry & Fancy Pigeon Association is dedicated to the promotion and facilitation of the breeding and exhibition of fancy pigeons in the Pacific Northwest. Are you new to the hobby and would like to know more about raising show pigeons. View information and images from the yearly winter and lawn shows. If you have found a pigeon and would like to return it to it's owner, there are a few things you should know. Classified ads are provided free of charge to our members.